The High Line Canal Conservancy is nearing the end of a significant planning initiative for the High Line Canal, our beloved 71-mile regional trail. This multi-jurisdictional planning initiative follows on the heels of the Community Vision Plan completed in early 2017. The nationally recognized planning team includes Denver-based Livable Cities Studio led by Meredith Wenskoski, and the Boston-based team of Agency Landscape + Planning and Sasaki, led by Gina Ford. This planning phase focuses on a Framework Plan – a multi-year implementation plan – to ensure that the Canal reaches its greatest potential as an environmental, recreational, social, historic and economic asset. It will include prioritized enhancement projects, complete plans for signage and wayfinding and landscape design guidelines for all 71 miles. For more details on these plans, click here or see below. The Framework Plan has entered its final stage! The High Line Canal Conservancy hosted two Community Open Houses on January 23rd or 24th where over 300 community members showed up to help guide the future of the High Line Canal. With this community feedback and input, the planning team is working to finalize the plan in the coming months. Public open houses held in April of 2019 included an existing conditions analysis, preliminary signage designs and an opportunity for input on potential enhancement projects and project priorities. See the presentation boards and meeting summary to the right. Additionally, in August and September, the team held a series of six focus groups targeting the different geographic regions of the Canal with the intent of receiving feedback on the preliminary opportunity area designs and on specific placement and priorities for Canal-wide amenities. Now with the existing conditions and canal-wide framework complete, the team has identified areas for catalytic improvements. These opportunity areas have been selected from a long list of projects developed through existing conditions, jurisdiction feedback and framework analysis. Conceptual plans will be developed for the chosen areas to address physical challenges and realize opportunities. Paired with the opportunity area designs, landscape design guidelines will establish design typologies and site-specific components in each area, such as benches, trash cans, trailheads and vegetation standards. The landscape design guidelines will be enhanced by the botanical survey being performed by the Denver Botanic Gardens in partnership with the Conservancy. This survey of plant communities along all 71 miles is well underway – read about the progress here: “The High Line Canal: Which plants green this greenway?” by Christina Alba. In addition, the planning team worked with Arthouse on the design of consistent and unified signage and wayfinding for the Canal. To see the progress, please see the open house signage feedback to the right. Continued support and engagement from the citizens of the region is vital to ensure the future of the Canal is reflective of the community vision. Join us in January for the final stage of public open houses before the Framework Plan is final. WHAT IS THE FRAMEWORK PLAN? WHAT ARE LANDSCAPE DESIGN GUIDELINES? WHAT IS THE SIGNAGE AND WAYFINDING PLAN? The planning process has included numerous stakeholder engagements, including 4 Canal-wide public meetings. See below for presentations boards and summaries of the public’s input. In 2016, the Conservancy led a vision planning initiative that engaged over 3,500 community members. 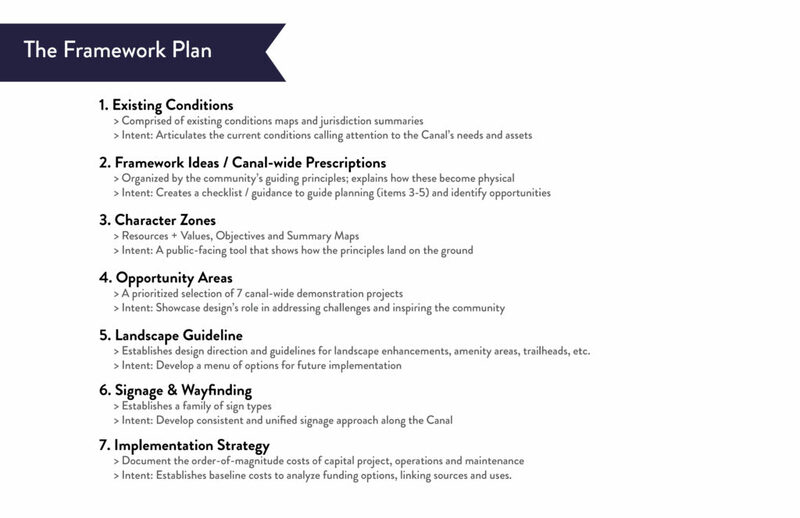 To learn more about the resulting Community Vision Plan for the High Line Canal, click below.